Rt Hon. 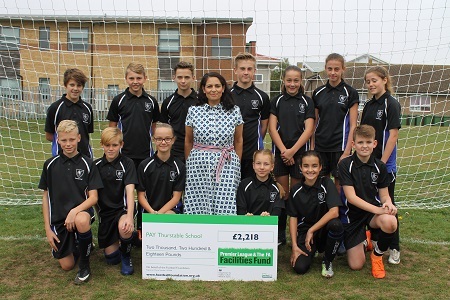 Priti Patel, MP for Witham, was welcomed to Thurstable School in Essex today (Friday 5 October). The MP was there to officially award a cheque from the Premier League & The FA Facilities Fund, towards the school’s goalpost replacement project. The grant will enable the school and Leisure World Tiptree, run by Colchester Borough Council, to replace four sets of goalposts on their grass pitches. Due to their age, the posts are in a state of repair, and their dangerous condition had already caused one of the pitches to be taken out of use, with the remaining three also at risk of being closed off. The brand new goalposts, mean that the school’s four pitches can allow local football participation levels to continue. This will benefit over 200 users including the school’s students, Colchester United Academy players and a range of local grassroots clubs. Users are also able to take advantage of a third generation (3G) artificial grass pitch (AGP) on-site. The pitch was first installed at the school in 2003, along with new changing rooms, thanks to a grant of £382,855 from the National Lottery and the Football Foundation. The pitch was recently refurbished, having reached the end of its operational life, to ensure the area continues to have access to a state-of-the-art facility. Thurstable School and Leisure World worked in partnership with the Essex FA to secure the £2,218 grant from the Premier League & The FA Facilities Fund. Leisure World and the school have a close relationship with the County FA, as the organisations work together to optimise the 3G AGP for the local community’s needs. Since 2000 the Football Foundation Funding Partners’ investment has provided 382 grants worth £16m towards grassroots sports projects worth almost £30m across the whole of Essex. Paul Thorogood, Chief Executive of the Football Foundation, said: “The Premier League & The FA Facilities Fund is dedicated to improving grassroots sport across the country, and I am pleased to hear that their investment is going to support Thurstable School in replacing their goalposts. My thanks goes to the Rt Hon. Priti Patel MP for taking the time to officially award the cheque for funding. “This project will be of real benefit to players in developing their game. Through the investment of the Premier League, The FA and the Government, via Sport England, the Football Foundation is working hard to support improvement at all levels of the game, and this is a great example of its work taking place across grassroots football.